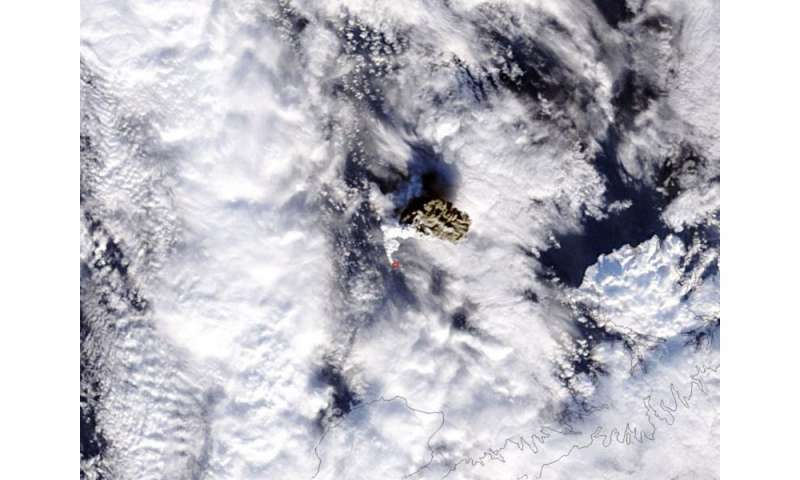 When NASA's Terra satellite passed over Alaska's erupting Bogoslof Volcano the MODIS instrument aboard captured an image of a large ash plume surrounded by clouds making it appear to be wrapped in white. The Bogoslof Volcano is located on Bogoslof Island at 53°55'38" north latitude and 168°2'4" west longitude, along the southern edge of the Bering Sea. It is about 35 miles northwest of Unalaska Island which is part of the Aleutian Island chain. On January 18 at 5:35 p.m. EST (2235 UTC) the Moderate Resolution Imaging Spectroradiometer or MODIS instrument flies aboard both NASA's Terra satellite captured a visible image of the volcanic ash plume which appeared dark brown. The plume stood out in the image because appeared in the middle of white clouds associated with the southern quadrant of a low pressure system. The low pressure center was north of the area. The Alaska Volcano Observatory or AVO is a cooperative program of the U.S. Geological Survey, the University of Alaska Fairbanks Geophysical Institute, and the Alaska Division of Geological and Geophysical Surveys. AVO provides updates on eruption levels. There are four levels of eruption: Green, Yellow, Orange and Red. Green is a non-eruptive state. Yellow means the volcano is exhibiting signs of elevated unrest. According to the AVO website, an Orange aviation code means that the volcano is exhibiting heightened or escalating unrest with increased potential of eruption, timeframe uncertain, or, the eruption is underway with no or minor volcanic-ash emissions. Red means and eruption is imminent or underway. On January 19, the status level for Bogoslof was red. On January 18 at 6:25 p.m. AKST (local time)/10:25 p.m. EST (January 19 at 03:25 UTC) the Alaska Volcano Observatory Status Report noted that the eruption occurred at about 5:20 p.m. EST (22:20 UTC) and " Pilots reported the cloud reached a height greater than 31,000 feet and prevailing winds carried it northeast over the Bering Sea. This eruption also produced lightning strikes, and infrasound signals detected by sensors in Sand Point and Dillingham." The AVO report noted that just after the eruption when NASA's Terra satellite passed overhead, the dark ash cloud was seen just northeast of Bogoslof. AVO said "This cloud was darker in color, and presumably more ash-rich, than others we have seen in the eruptive sequence, which began in mid-December 2016. This image also suggests the presence of very hot material (lava) at the surface immediately surrounding the vent – the first such observation during this eruption sequence."